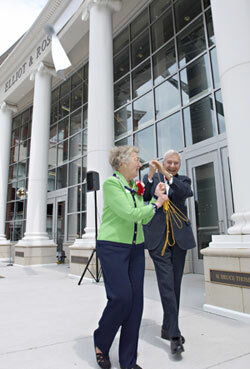 University of Lynchburg’s Centennial Hall, which opened in the fall of 2005 to celebrate the College’s first 100 years, has been renamed Elliot & Rosel Schewel Hall. Former Virginia Gov. Mark Warner spoke at the renaming ceremony May 18. Warner said it was appropriate to name a facility with cutting-edge technology for the Schewels because future jobs will depend on a high level of technological savvy. “The next 10 years will totally transform where we work and how we work,” he said. The University of Lynchburg Board of Trustees voted unanimously on Feb. 24 to rename Centennial Hall in honor of the Schewels for their ongoing commitment of time, energy and generosity to the College. For more than 40 years, the Schewels have been tireless advocates of LC and its advancement. Their largesse extends to support of the $12.5 million, 68,000-square-foot technology-based building that now bears their name. Elliot & Rosel Schewel Hall sets a high standard for communication, business and modern language facilities. The architecture combines gleaming glass, red brick, and white columns to match the traditional Georgian style of the campus, while projecting a futuristic look. Rosel Schewel served as a tri-chair of the Centennial Campaign and Elliot Schewel was co-chair of the Centennial Hall Committee. Both served on the Centennial Campaign Phase II Steering Committee. A graduate of E.C. Glass High School and Washington and Lee University, Elliot Schewel served on LC’s Board of Overseers from 1965 to 1991, and is an honorary life overseer. He established the Rosel Schewel Lecture in Education and Human Diversity in 1992 to honor his wife. In 1995, he retired after 20 years in the Virginia Senate, where he served as chairman of the Senate Education & Health Committee, and a member of the powerful Senate Finance Committee. He was not only one of the state’s most influential senators, he was also one of the most respected and effective. He received a doctorate of humane letters from University of Lynchburg in 2000. “We really don’t think there’s anything more important than educating our children,” Elliot Schewel said. Rosel Hoffberger Schewel ’71 MEd, ’83 Ed.S., ’00 D.Ed., is a longtime LC professor and member of the Board of Trustees. Following graduation from Hood College in 1949, she was a reading specialist and taught learning disabled students in Lynchburg City Public Schools. She was a faculty member in the School of Education and Human Development at LC from 1973 to 1992 and chaired the committee to bring the Virginia Baptist Hospital program to the College. “When I started teaching at LC, I got real interested in that college,” Rosel Schewel said. The kind of students LC attracts, the service learning philosophy, and the emphasis on training teachers and nurses impressed her, she said. During the renaming ceremony, Rosel Schewel said that college graduates face a world in turmoil from war, pollution, poverty and terror. “We’re convinced that a University of Lynchburg experience helps young people face these troubled times,” she said. Rosel Schewel started the Faculty-in-Residence program, chaired the successful fund-raising campaign for the Thompson Education Building, and helped establish the University of Lynchburg School of Education and Human Development Advisory Board. In 1989 she, along with her colleague Dee Wolfe, was honored with the Innovation in Teacher Education Award, Clinical Faculty Program, presented by Southeastern Regional Association of Teacher Educators. Rosel Schewel has been a member of the LC Board of Trustees since 1980 and was the first woman to serve as chair (1998 through May 2002). Her dedication to her alma mater has earned her many awards including the T. Gibson Hobbs Memorial Award (1966) and the Distinguished Alumna Award (1993). The Rosel H. Schewel Distinguished Professorship in Education and Human Development was established in 2002 by her children Steve, Michael, and Susan Schewel and other members of the Schewel and Hoffberger families.